How can you save money on youth sports? I’ve always loved saving money and the last few years our two young kids have played basketball, baseball, t-ball, and soccer so I guess it makes sense that I’d have a lot to share on the topic of cutting costs for youth sports. My suggestions will be most helpful to the parents of kids who play a sport for more than one season. If your child has shown an interest in a sport and you think you’ll be paying for them to play it for the next several seasons or even years these tips can save you a lot of money. The main cost categories of youth sports are equipment and fees. For some families the travel expenses can mount up but I don’t have experience with saving money on youth sports travel so I won’t address it here. I’ll start off talking about equipment because that is pretty universal; the same sport requires the same equipment where ever you play. The fees will vary across sports, parts of the country, and competitive level of play so we’ll get to those later. The biggest money-saving tip I can give you about youth sports equipment is to plan ahead. If you are on the ball you can cut your equipment costs by anywhere from 10 to 60 %. On the other hand if you wait until the last minute you may end up paying top dollar. Since most sports are seasonal the timing is very predictable which makes it pretty easy to plan ahead. Not only does planning ahead save you money it can also help you budget for the costs in advance. As sports go in and out of season you can usually get the best deals at the end or the beginning of the season. There are a few events that happen every season in most sports that you want to be notified about. Sign up for the email list of your sports organization. Often before the season starts they’ll send out a discount coupon for a nearby sports retailer for anywhere between 5-20% off. Many times these types of sales only last for a day or weekend so it’s important to jump on them quickly. Often they’ll require you to bring in a special coupon. Even better than discounts are the opportunities to trade for free gear. Many larger sporting organizations schedule a gear swap day at the start of the season. You bring in the equipment that your child has outgrown and swap it for a larger size. For example we bought our daughter a pair of soccer cleats when she first started playing. Ever since then we just keep trading that pair up for a larger size. Be sure you’re signed up for the email notifications from your sporting organization so you can schedule time to attend these swaps and save tons of money. Sign up for the email list of a local sports retailer or a big sports store like Dicks Sporting Goods. When the season’s over they’ll likely discount some of their equipment. If you see an email for discounts in your kid’s sport click on them and scan the sales. It’s kind of creepy but with technology these days they’ll know what you’re looking at, learn what you’re most interested in, and will notify you when those types of things are on sale. Another great time to save on sports equipment is during Black Friday and all the sales that happen around the holidays. One thing that can make it kind of tricky buying off-season knows what size to get. The biggest savings during this time of the year typically aren’t on regular equipment but on the high dollar items. If your child has gotten serious about a sport chances are you’ll need to buy equipment other than what they wear in games. For example you might buy a basketball goal for your driveway, a soccer goal for your backyard, or a baseball rebounder. You can save a lot of money on these big ticket items at this time of the year. These types of things are a little bit harder to spend money on because your kid isn’t required to have them to play and they’re expensive. You can definitely make an argument for not buying them. But as a sports parent I’ve taken the approach of trying to get my kids the best equipment & training I can for a reasonable amount of money. If you buy the cheapest stuff it won’t last as long. Like all other purchases, it’s a balance between cost and quality. Sales like these give you a chance to get something that won’t fall apart after just one season at a reasonable price. For example GoalRilla specializes in different types of goals (soccer, basketball, etc) – they’re top-quality but also expensive. During the holiday season I saw their soccer rebounder discounted over $100 in an Amazon lightning deal. Also if your kid’s team needs equipment this is a good time to buy it. Whether you’re helping coach a team and buying equipment you need or if you’re just pitching in to help cover the coach’s costs buying things like cones, pinnies, whiteboards, etc. during these sales can lower the cost. In any sport that uses a ball chances are it will get lost or ruined during the course of the season. When you see these types of things on sale buy multiple at once and keep them in your basement or attic. That way when your son or daughter loses a ball you don’t have to go buy another one at full price. One item that always seems to be disappearing is water bottles. It’s probably because a lot of them look the same, over half the kids on the team have the same Gatorade squeeze bottle . Don’t spend a lot of money on water bottles because your child will probably lose a few of them. We wrap ours in red duct tape so no one will confuse the bottle for theirs & walk away with it. It’s also smart to write your kid’s name & your phone number on their equipment. One of the reasons that we don’t plan ahead is because we’re busy parents. Shopping online can help make things a little bit easier for you to think ahead. If you are buying online one of the common strategies you can use is to bundle your purchases to save on shipping. Many places will give you free shipping if you spend over a certain amount of money. Some places, like Dicks Sporting Goods, offer free shipping and free returns on shoes. Of course the tricky thing about shopping online (and also about buying off-season in general) is knowing what size to get your kid. One of the strategies we’ve adopted is to buy multiple sizes of the same item when it’s on sale. This not only makes it easier for you to hit the minimum spend to get the free shipping. It also has you covered in terms of having the right size when the season starts. If something is too small you should return it right away. But for the sizes that are too big often we’ll just hang onto it & have it ready when they outgrow the current size. Buying multiple sizes can be important during the beginning of season sales I mentioned earlier. Take my experience with baseball pants as an example. At the start of the season there was a range of youth baseball pants available and most parents just opted for the cheapest brand. I was in the store but didn’t have my son with me so I took a best guess on the size. Turns out I guessed too small and when we came back for a bigger size all the cheapest types of pants were completely sold out. To add insult to injury, the 20% off pre-season sale had ended so I not only had to buy the $20 more expensive brand but also at full price. So you can probably guess what I did the next year during the baseball pre-season sale. That’s right; I bought 3 different sizes of pants and brought back the 2 that didn’t fit. It’s a good idea to ask other parents or coaches for advice on what equipment you really need for that age range. If you don’t ask ahead of time it could be that you buy equipment that you don’t actually need b/c it’s not used or can be shared at that particular age. Or there may be things you hadn’t thought of and if you wait until later to buy them you miss out on early season sales and the option of free shipping bundles. This doesn’t happen as often if your son or daughter is playing a sport that you know well. But if they’re into a sport you never played yourself there are definitely things you can overlook. For example, last season I didn’t think to get my son batting gloves for baseball during the pre-season sale so I had to pay full price a week later, yuck! I don’t know if it’s the same in every sport but in soccer one item I’ve seen that has high markups are the shoes. You can find a $30 pair of Adidas soccer cleats on sale for a decent price for a 9 year old and they’ll last you all year. But you can also go out and buy a $90 or $100 dollar pair of cleats for the same kid. In my opinion, those $100 shoes aren’t going to make them play any better. The older they get the more conscious kids seem to be about having the top of the line shoes. You can find pairs of soccer cleats for over $200 dollars for teenagers. I haven’t had to deal with those prices yet because my kids are still young but when the time comes if they want shoes that expensive they’ll be paying for that big markup themselves. One good way to find used sports shoes for kids is big consignment sales, like Just Between Friends. We’ve found several good pairs of Adidas cleats for cheap at these sales in the past. There are also stores that specialize in reselling used sporting equipment, like Play It Again Sports. In the past I actually looked into buying a franchise because the demand (and potential savings for customers) for used sports goods is so high. If you have several children in your family that all end up playing the same sport one trick is to buy neutral colored gear. That way when you hand it down the little brother won’t refuse to wear his older sister’s pink cleats. It can also help if you try and sell your equipment in a consignment sale, a gender neutral color means you can interest parents of both boys and girls in your items for sale. This one can be a bit tricky because sometimes you actually pay more for a package since a store is charging you for the convenience of putting it together. In some cases you can actually buy the components separately for less than they charge for the package. However, that’s not always the case. For example, Dicks Sporting Goods offers a starter soccer package every season with a ball, shin guards, and cleats and the package cost is actually lower than price would be of buying them separately. Not only that, but when they offer their 20% off one item promotions you save more with buying the bundle because you’re saving 20% of the total cost of all the gear rather than just a ball or just the cleats. Another example is this soccer training package that contains soccer balls, gear bag, ball pump, training cones. If you add up the cost of all the items individually it definitely exceeds the price of the package. Another way a bundle can save you money is this Dribble Up smart ball package that includes not only the soccer ball but also related items, in this case some of the technology required. So if a site specializes in sporting goods or even a certain sport like soccer, if there are items (technology) or services (installation/training) that are necessary but would be more expensive to buy or hire outside of that sale then a package can also save you money. One thing you don’t have a lot of control of when you play sports is the uniform itself. For recreational teams it’s often just a t-shirt with a team sponsor on the front so it doesn’t make much difference. However once you get into more competitive teams you’re suddenly buying Nike Dri-Fit uniforms or Adidas jerseys for your kid and the club usually dictates where you buy them from. Theoretically they should be able to get a reduced rate because they’re making a bigger purchase, particularly if you’re part of a larger sports organization. But regardless you don’t have any ability to shop around or find discounts on the team uniform. One thing you do have control over is what size to purchase. When we buy a uniform like this I always try and buy one size up. That way you can get an extra season of use out of it. Another annoying thing for me is that I’ve never had a club negotiate free or reduced shipping from the vendor so you still have to pay to ship the uniform. So if you think you’ll need any extra pairs of socks or a backup jersey order it up front otherwise you’ll have to pay for shipping twice. That pretty much covers my tips for saving money on sports equipment. The next big cost category for youth sports are the fees. The amount of fees you will pay will depend on the level and intensity of games and training your child participates in. If they’re playing in a recreational league the main fee will be the cost of playing in the league. Depending on where you live and how hard it is to get a place to practice you may have to pay some fees to use the practice facilities. From a cost perspective recreational leagues are your cheapest option. There are a few things you can do to lower your fees a little. Many organizations give you a slightly discounted rate if you sign up for the league before certain deadline. It may only be a $10 discount but if you’re paying $100 to play in a recreational league that still a savings of 10%. Many recreational leagues are run in large part by volunteers. In some cases if you volunteer to be a coach or administrator the League or organization might give you a price break on the fees. Some teams and leagues do run fundraisers to help pay for the cost of the team. Where you start running into bigger fees in youth sports is when your kid starts playing at a competitive level. At that point your child probably plays in more games/leagues and plays in tournaments which all have registration fees. If you’re playing through a competitive club then you may be paying coaching fees and other fees to the club. If your child is thinking about playing on a competitive team be sure to compare the costs between clubs. They should give you a breakdown of all the costs for a year. Competitive sports often run for 9-11 months out of the year, which means the overall costs will be higher. In our metro area there’s a pretty big range between clubs in the total cost of playing. So if your child really loves a sport and is really good at it be sure to price all your options before saying no due to cost. In many cases the coaching fees will make up the biggest percentage of the costs, maybe half or more. There are some organizations that have competitive teams that are coached by volunteer coaches which can significantly cut down on the costs. As with anything in life you get what you pay for but don’t discount the ability of these volunteer coaches outright. Many times these teams are coached by a parent whose child is on the team. In some cases that parent may have a lot of experience playing the sport and perhaps even coaching it as well. If your son or daughter is just getting started playing at a competitive level an organization like this could be a good place to start. Similarly to some rec leagues, if you volunteer for a position like team manager many clubs will give you a discount on the fees. If your son or daughter is really into a sport and wants to keep getting better their coach may suggest additional training to help improve their skills or their speed and agility – which means more fees. There are a few ways to lower those fees. There’s a really good speed & agility program in our area that does a great job getting results for youth athletes but it can also be pricey. I’ll use them as an example. The most expensive option is to get one-on-one training for your child. I don’t know of a way to get a discount on this option other than asking the organization your child plays with if they have a partnership discount with the company that does the training. If the organization is big enough it might hire some of those coaches to offer training sessions of their own. For example, a local soccer club hires one of these speed & agility coaches to hold a training session every Friday night and it’s much more affordable than a one-on-one session. The other option is to look into group training sessions. The individual training is unaffordable for many but on two different nights a week they also offer group sessions at a greatly reduced cost. They hold multiple sessions a year and are always looking to fill them up. I know this because I’m on their email list and they’re always sending out emails right until the day it begins to try and get enough kids to fill up the group. So if you want to sign up for multiple sessions at once you can probably negotiate a discount. We’ve sent our kids to a few different sports camps. These are usually held off-season, to give kids a chance to keep their skills fresh, frequently this is over the summer. I was in charge of finding a good camp to recommend for my son’s soccer team this summer. My research turned up a ton of options and they’re not easy to compare because of the variety of camps. The camp duration, training frequency, quality of coaches, facilities, & training approach all made it tough to come up with a simple comparison. The best way I found to narrow them down was to ask around and get feedback from people that had attended them in the past. The best way to get a discount is to register early, many camps charge more if you register closer to the camp date. Another good option for getting a good camp for less money is to attend a camp that’s affiliated with a competitive club. These camps aren’t usually setup as money makers for the teams. Many of these clubs will run camps to give their current players a chance to play in the off season and they also use them to recruit kids for future seasons. Since the main goals of these club camps are training of their players and recruiting they often offer them for pretty reasonable rates. For example, kids may get 3 hours of training a week for a month for around $100. The combination of sports and technology has really exploded over the last several years. Technology in the form of websites and phone apps has made some things easier and faster and also created new opportunities for youth athletes and coaches. Earlier I mentioned that some teams offer a discount if you volunteer to be a team manager. There are a few free online tools you can use to manage your sports team. For managing a team roster, publishing and sharing game & practice schedules, and sending team notifications you can use Shutterfly Team sites or TeamSnap. We started off using Shutterfly, it offers the benefit of not only team management but also allows all the parents to share photos of their kids. We’ve used Shutterfly for one of my son’s teams for a few years and one neat thing is going back through the pictures from past seasons and seeing how they’ve grown & progressed over the years. I setup one of these sites and had to administer it and although it was free a few of the features were tricky to figure out. It’s free so you get what you pay for. One of my son’s new teams is using TeamSnap and so far it seems to be pretty slick online team management software. The benefit of TeamSnap is that it’s built from the ground up to manage teams so it’s pretty straightforward and has tons of features. It has a free option but also offers other plans that offer more functionality but charge a monthly fee. One of the biggest challenges when managing a team is keeping track of who has paid all the necessary team dues. This is relatively simple for recreational teams where the main fee is league registration. However for competitive teams using a free online spreadsheet like Google Docs is really helpful to keep track of which players have paid their fees for league registration, tournaments, etc. An online spreadsheet is nice because you can share it with coaches and team parents. Some of the coolest uses of technology in youth sports I’ve seen are ways to motivate kids to keep improving their skills. I’ve been using one of these tools called iSoccer with my son. It’s both an app and a website that helps players measure their skills and keep track of their improvements. The company that makes the software is expanding into other sports as well so keep an eye out for it. Like many apps these days, you can get a free iSoccer account for a single player. The free version doesn’t come with full functionality, for a monthly fee you can access all the features. I tried out the free trial and decided it was definitely worth the money, both for my son and for his whole team. I did find two ways to save money on the tool. If you sign up for a full year, rather than a month or a quarter at a time you get a pretty significant discount. You can also use an iSoccer promo code to save an additional percentage. Many online subscription based tools offer similar types of discounts through referrals. Coaches or players that currently use the tool are given a special referral code that when shared with others will get them a discount. So when you’re signing up for an online tool be sure to look for a referral or promotion code. If you’re a sports parent it’s important to set an annual budget for what you’re willing/able to spend. Just like any other type of spending it’s easy to nickel and dime yourself when it comes to youth sports costs. There’s always another tournament they could play in, another piece of gear or you could buy, or more training you could sign them up for. Constrain your cost by setting a cap on your spending. This is particularly important when you have multiple kids and they all play one or more sports. I know several families who were really surprised when they started keeping track and added up how much they spent on youth sports in the last year. – The most obvious is that it gives them great exercise. I could never get our kids to go into the back yard and sprint back and forth over and over but you put a ball at their feet and they’ll run much faster and much longer than they ever would in gym class. – Team sports do teach lessons about working hard, interacting with the others (whether they like them or not), setting goals, making & keeping commitments of practices/games, and overcoming disappointment when they don’t play their best or lose a game. At the end of one season I wrote about 15 youth sports lessons kids can use in their career someday. Working hard and getting good at a sport has also helped our kids build up their confidence and self-esteem. – The most important reason we continue supporting youth sports is that they have fun practicing and playing sports with their friends. I ended up playing team sports through high school and college and some of the people that I met in those years are still some of my closest friends. One trap I know some parents fall into is thinking of the money they put into youth sports as an investment towards getting college scholarships or even a professional career. It may be that your kid develops into an amazing player who someday will benefit from college tuition breaks or professional contracts but the odds are against it. As a youth sports parent it’s better off if you view the money you spend as an investment in some combination of the bullet points I mentioned right above. If college and pro sports end up following then that’s a bonus. The organization that you play with, the team you belong to, and your child’s coach will make a big difference as to whether it’s a positive experience for them or not. So it’s worth the time to investigate all of these before getting your kid involved. If you are going to invest the time and money into the sport you want to make sure they have a good experience and get something positive out of it. Every kid responds differently to various types of motivation and teaching. Try to find a coach who’s approach matches the style that is best suited for your child. It also helps if you can find a coach that is open to parent input. Obviously the coach has to make the ultimate decisions but if you’re spending time and money on the sport it would be nice to have a coach who takes parent input and feedback into account. On a recreational team you can often sign up your son or daughter on the same team with many of their friends. It’s more challenging on a competitive team because players have to try-out and earn a spot on those teams. What many teams will do is play in a recreational league in their earlier years and then when the kids get older and more skilled they all try out for the same competitive team. Whichever team you choose you want to try and set your kid up for success. It’s not a lot of fun for your child if they play on a team that’s so good that they never get to play in a game. It’s also no fun to play on a team that loses all of their games. Finding the right team and league means looking for a place where your son or daughter will be challenged but not overwhelmed. One way you can help with this is by choosing a club or organization that focuses heavily on player development. These types of clubs typically will have multiple teams at the same age level and they organize them by skill level. The emphasis isn’t on winning but rather on developing each player. As a kid progresses in their skills they can move up to higher skill level teams. This approach is preferred because your child gets to play against other kids at their own level, which builds their confidence and helps them develop faster. So, in addition to the cost comparisons I mentioned earlier this is something else to consider when choosing which organization to play with. Basically it comes down to setting your child kid up for success. As I mentioned, if you’re going to spend the time and money on the sport you’d like it to be a good experience for your kid. If they’re going to put in the work at practice and in games it would be nice to see them rewarded for their hard work and finding the right environment will go a long way towards making that happen. It turns out that this article ended up being a lot longer than I originally intended. 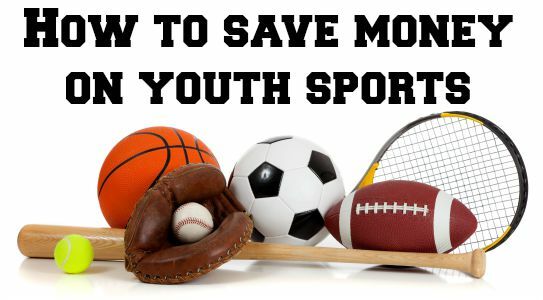 It actually started out as a list of tips I put together for a phone interview I did about ways to save money on youth sports. I couldn’t find the list when I got on the phone so I figured I should publish all the things I didn’t share. The more I added to the list, the more tips I remembered. If you have tips of your own that I didn’t cover, please add them in the comments below. As I mentioned, I didn’t talk at all about the costs of travel because we haven’t had to deal with that. If you have tips or suggestions on how to reduce the costs of traveling for kids sports definitely share them in the comments below and I’ll add them as well. Lastly if you have questions about what you’ve read please ask it in the comments and we’ll get it answered if we can. An amazing and detailed article! Thanks for so many useful tips! Black Friday and off-season always help. Buying used stuffs and swapping for new gears are really great ideas. Buying in many sizes is also good. Playing some simple and cheap sports is ok too, like swimming. Thanks for this article! I (and most of my friends) have kids that play sports and we often lament about the costs so I shared it on both Facebook and Twitter. A couple other things that have helped us. For equipment, we got some equipment for free from freecycle. It’s a group where people give things away for free. We managed to find some people who had outgrown their equipment or their kids were no longer playing the sport and they just wanted it out of their house. We also managed to get some equipment from other parents within the club team. Since kids are different sizes, there’s a lot of hand me down stuff that goes on and that’s also been helpful. And then there’s stores like Play It Again Sports which sell gently used equipment which is handy when you have growing kids. For travel… I have a kid that’s on a travel team and we travel all over the place. In order to help with that, I’ve been doing travel hacking stuff and managed to get the Southwest companion pass which let’s us fly with a buy one get one free deal on the airline – even when we pay with miles. And checked bags are free which helps when lugging around sports equipment. Again, thanks for this article. I’m sure other parents will appreciate it as well. I’ve never tried freecycle for sporting goods, I’ll check it out. I agree, the team hand me down route is great, that goes along with the gear swaps I mentioned. How difficult is it to get a companion pass? A free plane ticket will save you a ton! I hadn’t thought about the cost of checking sports gear but I can see how that would add up quickly. So you save at least $60 round trip on sports bags by flying Southwest, nice!